We’re now up to 347 detected exoplanets around 293 stars. The latest find turns out to be intriguing on several counts. VB 10 is a red dwarf about 20 light years away in the constellation Aquila. Its newly detected planet is a gas giant with a mass six times that of Jupiter, a ‘cold Jupiter’ not so different from our own. Interestingly, although the star is considerably more massive, both planet and star should have roughly the same diameter. More good news, then, for the M-dwarf contingent, among which I count myself an enthusiastic member. The gas giant here actually orbits every nine months at a distance similar to Mercury’s spacing from the Sun (fifty million kilometers). Inner, rocky planets could exist in this star’s habitable zone. But despite the effects of tidal lock, there is continuing speculation that temperate conditions could exist on such worlds. So does VB 10 actually house a solar system not so different from our own? We don’t know, but what does become apparent is that any techniques that help us find ‘cold Jupiters’ (as opposed to the ‘hot Jupiters’ so prevalent because of selection effects in our early results) will help us turn up more systems arranged something like ours. The other noteworthy aspect of this work is that the observations, made at the Palomar Observatory near San Diego, flagged the star by means of astrometry. Unlike radial velocity studies, which look at the Doppler shifts in starlight as a star is pulled toward and then away from us by a planet, astrometry detects the tiniest of changes in the positions of stars in the sky. VB 10b becomes the first exoplanet found using astrometry, a method Pravdo calls “…optimal for finding solar-system configurations like ours that might harbor other Earths.” More in this JPL news release. At only 20 light years away does this make it the closest exoplanet observed so far? Geoffrey, we’ve got evidence for a Jupiter-mass exoplanet orbiting Epsilon Eridani, so that would be about half the distance, at 10.5 light years. And as discussed here recently, we should have hard evidence one way or another on the Centauri stars within 3-5 years. This would have made Peter van de Kamp very happy. What’s the metallicity of VB 10? 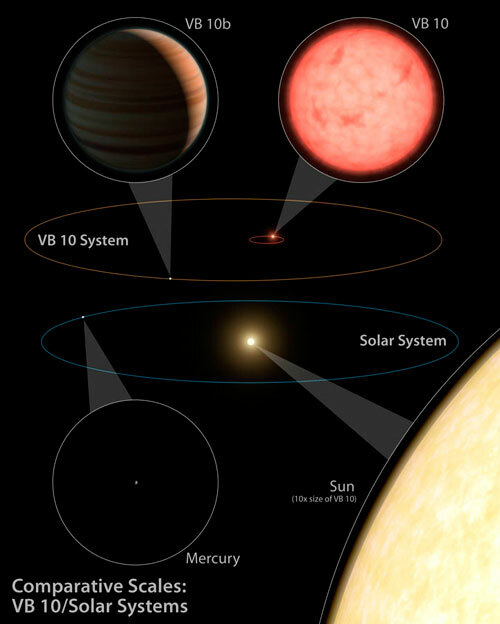 While VB 10 is indeed small, to say it is the smallest known exoplanet host may be deceiving. The news media always tries to sell their story, and are always claiming new record smashers and new “fists” (do you know how many times water has been discovered on Mars? Or how many “first images of exoplanets” there are? There’s got to be at least 4 different planets who were imaged, all of them being the first planet to be imaged. According to this paper (found in a Google search for M dwarf metallicities), VB 10 (=GJ 752B) has a metallicity slightly less than solar. Mass ratio is quite high, same mass ratio around the Sun would give you something quite close to the star/brown dwarf boundary. Although we should note that in this case the claim is being made by JPL. Some of the reports are saying that the mass of the Jupiter-sized planet is likely to preclude stable orbits for any Earth-like planets closer in. And given that VB10 is a flare star, the odds of finding conditions suitable for life (as we know it, anyway) are extremely slim. That said, it’s always exciting when another methodology for finding exoplanets starts to bear fruit, and I assume that astrometry will help to expand the range of orbital orientations we can find exoplanets in (like those that are face on to Earth, like seeing a dinner plate from above). If someone else ever confirmed it, there’s 2 or 3 planets around Lalande 21185, which is only 8.3 light-years away. The University of Pittsburgh’s Allegheny Observatory released a report in 1996 saying they’d observed planetary sized perturbations of Lalande 21185 in a series of old photographic plates and in a series of follow-up observations, but aside from the bare report no journal published proclamation of the planets has appeared. So the world is still uncertain whether the planets exist or not. Awesome. All I can say is good going to the exoplanetary scientists who motivate such discoveries. Imagine the fusion fuel available from this planet, which is cool so that the fuel might be easily extractable by some form of orbiting bean stalk like fuel elevator. Then there is the prospect that this large planet may have moons around it perhaps some close to Earth is size and mass. Hats off to Pravdo & Shaklan for their discovery. Would tidal lock be an advantage to life on a world (not this one obviously) orbiting a flare star? Pat Galea: only if you assume that the set of possible definitions that require hydrogen-1 fusion is comprised solely of the definition that contains only that requirement. This is a story about a discovery that, although important, is not telling us something that we don’t already know: that small stars can form planets. There are several other examples of M-dwarf stars with planets, including on of the smallest exoplanets found to date (as mentioned above). In fact, I think the evidence is mounting in favor of the notion that these small stars can form just as many planets as larger MSs, but tiny star planets tend to be smaller because most M stars cannot form gas giants in time. As for astrometry and planet finding, isn’t ESA’s GAIA mission supposedly the next big thing in this arena? Gaia will pinpoint exotic objects in colossal and almost unimaginable numbers: many thousands of extra-solar planets will be discovered, and their detailed orbits and masses determined; brown dwarfs and white dwarfs will be identified in their tens of thousands; some 20 000 supernovae will be detected and details passed to ground-based observers for follow-up observations; Solar System studies will receive a massive impetus through the detection of many tens of thousands of new minor planets, and even new trans-Neptunian objects, including Plutinos, may be discovered. I have a few questions for everyone. This interesting discovery reminded me of something I read about the largest possible diameter for a gas giant. Apparently, if a gas giant is too much more massive than Jupiter, the planet will actually contract under its own weight to a diameter less than or equal to that of Jupiter. If I remember correctly, the mass at which this contraction begins is ~3 Mj. But I forget what the maximum diameter is right before this contraction begins. Does anyone have any information about the maximum diameter for a gas giant? Also, I’ve seen space art pictures in which the gas giants depicted have green or blue colored atmospheres. Is this likely? Obviously it will depend on chemical composition, but what are the types of colors we could realistically expect to find for gas giant atmospheres throughout the Universe? On earth being a ‘brown dwarf’ because of fusion being achieved, don’t H-bombs do H-1 fusion (and that would make earth a star!)? I’m also puzzled as to why so many people insist that flare stars are such a show-stopper for life. Any lifeforms living in a deep aquatic environment (which is one of the prime candidates for the location where life began), would not even notice a flare of pretty much any size. For that matter, an earth sized planet, big enough for sustained internal geologic activity, even if ejected from its host star system early on by say a gas giant, if it had a covering of water, would have pockets of melted water around hydrothermal vents, and would probably support ‘life as we know it’, since hydrothermal vent ecosystems are among the different types of ‘life as we know it’. Stars and their nature are completely irrelevant for this type of habitat. I am wondering two things: (i) how common are objects such as VB 10b, and (ii), given its high mass might this system be better referred to as a binary system? Perhaps VB 10b formed like a star–that is, by gravitational collapse rather than by core accretion. This brings me to another question: what is the minimum mass of objects that can be formed via gravitational collapse. Also, if VB 10b-like objects turn out to be uncommon, then this will lend even more credence to the idea that these objects are just rare examples of multiplicity among small stars. A paper by Charles Lada from a few years ago talks about the mounting evidence that small stars tend to be single with greater frequency than larger stars. Explanation: Can a planet be as large as the star that it orbits? Recent observations have discovered that nearby Van Biesbroeck’s star might have just such a large planet. Although VB 10 lies only about 20 light years away, it is a small red dwarf star so dim, at 17th magnitude, that a telescope is needed to see it. Van Biesbroeck’s star was previously known for its rapid proper motion across the sky — it moves so fast it could cross a full moon in only about 1,000 years. By noting a wiggle in VB 10’s sky trajectory, astronomers were able to infer the existence of a planet several times the mass of Jupiter. Although the star VB 10 is perhaps 10 times more massive than the discovered planet VB 10b, the star is likely more highly compressed and so the two might be closely matched in size. Such a system is envisioned below with an artist’s illustration. Since faint M-type stars like VB 10 are so common, planetary systems surrounding them, including planets larger than their parent star, might be more common than planetary systems like our own Solar System. Abstract: We have derived masses and radii for both components in five short-period single-lined eclipsing binary stars discovered by the TrES wide-angle photometric survey for transiting planets. All these systems consist of a visible F-star primary and an unseen M-star secondary (M_A > 0.8 M_sun, M_B < 0.45 M_sun). The spectroscopic orbital solution combined with a high precision transit light curve for each system gives sufficient information to calculate the density of the primary star and the surface gravity of the secondary. The masses of the primary stars were obtained using stellar evolution models. The solutions were compared with results obtained by calculating the radius of the primary stars under the assumption of rotational synchronization with the orbital period and alignment between their spin axis and the axis of the orbit. Four systems show an acceptable match between the two sets of results, but one system shows a clear mismatch between the two solutions, which may indicate the absence of synchronization or a misalignment between the rotational and orbital axis. When compared to low-mass stellar evolution models, the derived masses and radii of the unseen M dwarfs are inconsistent (three only marginally) with the predicted values, with all of the radii being larger than expected for their masses. These results confirm the discrepancy shown in previous work between the predicted and observed radii on low-mass binary stars. This work also shows that reliance on the assumption of synchronization to derive the mass and radius of stars in eclipsing single–lined F+M binaries is a useful tool, but may not always be warranted and should be carefully tested against stellar evolution models. Looks like the curse of astrometric planet detection strikes again… VB 10b is not detected in radial velocity measurements. In May 2009, astronomers were jubilant: finally, an extra solar planet had been found by using the method of astrometry. That’s great, except, they may not have found a planet after all. Researchers from JPL reported they found a Jupiter-like planet around a star smaller than our sun. But follow-up observations of the star VB10 are coming up empty. “The planet is not there,” said Jacob Bean from the Georg-August University in Gottingen, Germany, who used a different and more successful approach to look for exoplanets, radial velocity. And just in case you weren’t convinced by that radial velocity survey, here’s another failure to confirm the planet. Astrometry as a method for planet detection is jinxed.